All the Delicious Freebies We’re Eyeing on Tax Day 2018! You don't have to spend you refund check all in one place. Thanks to some Tax Day freebies, you can eat away all the stress and anxiety associated with April 17 — also known as the last day to file your income tax return. Unless you're like us, and filed for an extension. Several major fast food chains and retailers are offering discounts or completely free treats to celebrate (or help you forget) taxes until next year. Keep reading below for some of the best Tax Day freebies you can cop in 2018! Take 15 percent off takeout orders when you purchase online and over the phone with the promo code "TAXDAY." Stop by a $5 Cuervo Blue Margarita special on April 17. Cheers. Enjoy the $10.40 Tax Day Meal, which includes a half chicken with two sides, cornbread, and a drink. All you need to do is download the fast food chain's app to unlock a deal for a 10-piece chicken nuggets for $1.48. Sign us up. Need a sugar fix? Pass by a participating store for a free cookies & cream cookie. Warning: one per customer. Bring the kids along for this deal. The family entertainment chain is offering buy one, get one free cheese pizzas all day long. Bring a friend and treat them to lunch today! 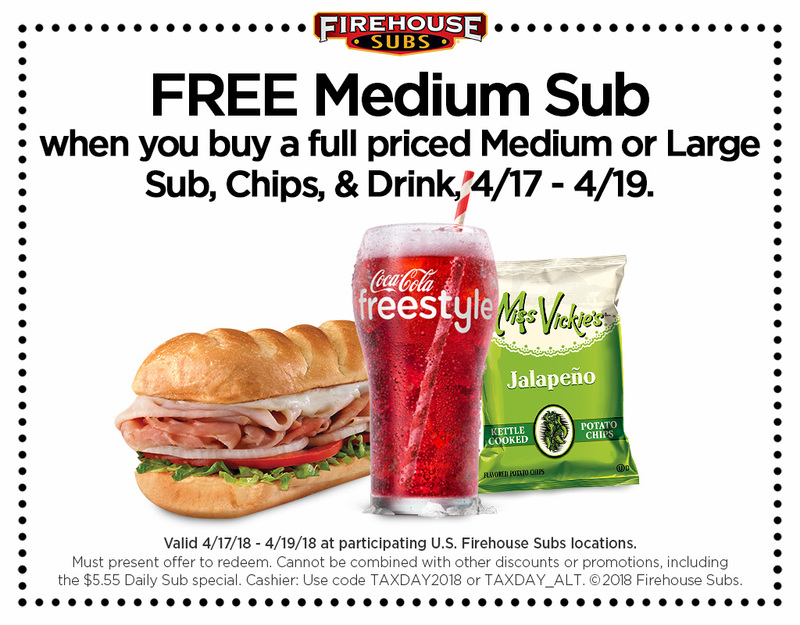 Using this coupon, you can get a free medium sub with the purchase of full-priced sub and medium drink. How does a free Pizookie sound? Get one with a food purchase of $9.95. What's better than shaved ice? Free shaved ice. You're welcome. Find a local truck here. The popular fast food restaurant is giving customers 10.40 percent off any sandwich. We'll take it. This mall favorite stop is giving out free a turkey or veggie dog to customers. Again, one per customer. The restaurant chain is giving customers a free order of fries with any purchase. Half-priced cheeseburgers for everyone. No coupon necessary. This one might not be related to Tax Day but all month long, the restaurant is offering $1 margaritas. You can't go wrong with that. All you have to say is "Tax Crunch" and you will receive free chips and queso. However, a purchase is necessary. This Is Not a Drill: Applebee's Is Serving up $1 Bahama Mamas All. Month. Long.